Welcome to Peoria Ford Since 1991, Peoria Ford has worked hard to earn the loyalty of drivers in and around the West Valley. From day one we've been committed to providing a welcoming atmosphere so that guests feel right at home and we always endeavor to treat our patrons with the same level of integrity, kindness and respect that we give to our own friends and family. These are just a few of the reasons why customers continue to come back to us time and again. Our Phoenix-area Ford dealership has been family owned and operated for over two decades, and during this time we've kept up a tradition of being absolutely committed to attaining 100-percent customer satisfaction. If you're looking for new Ford cars near Phoenix, come to us to browse a full lineup of sedans, coupes, SUVs and trucks, and receive professional service from our knowledgeable sales team! As you cruise around Peoria on your test drive, you'll be given all the details you need to know about award-winning vehicle models like the 2018 F-150, Escape, Edge, Fiesta, Fusion and iconic Mustang! We also provide onsite research tools, including review and compare pages , a trade-in appraisal tool and an incentives feed that'll give you information about the most current manufacturer specials. By the way, there are many great finance and lease opportunities for qualified shoppers, but our strong financial network also provides assistance to those who've experienced bankruptcy or foreclosure as well as to those with bad or no credit. Contact our finance department for assistance, then preview our HUGE selection of new Ford cars. We haven't become one of the county's highest volume Ford dealership based on new car sales alone. We're also proud to be Arizona's Certified Ford Depot! We always have Certified Pre-Owned models among our collection of used Ford cars, and all come with comprehensive and powertrain warranty coverage, a 172-point vehicle inspection and a CARFAX vehicle history report! We're confident you won't find a Ford dealer in Phoenix with a better selection of vehicles, so come to us first the next time you're in the market for a new or pre-owned car! When you need repairs, maintenance service, genuine Ford parts or accessories, we're also here to assist. Peoria Ford's service center is run by certified mechanics who are well-versed in performing the gamut of vehicle maintenance work, from simple oil changes to intricate transmission repairs. Whether you purchase one of our new or used Ford cars in Peoria and want to come to us for follow-up services like oil changes and tirerotation, or whether you currently own a vehicle of a make other than Ford, our service team is at your disposal. You can even schedule service appointments at our auto repair shop or get collision center estimates online! For repairs, bring your car to our Ford dealership near Phoenix and enjoy the confidence of knowing that we use genuine OEM replacement parts. We also have many available accessories, so you can personalize your car with appearance, performance, tech or convenience upgrades. Additionally, if you've recently been in an accident, our dedicated collision repair facility can help get your car looking like new again. Stop by for body work, paintless dent removal or auto repair in Peoria, or visit to find the car of your dreams! If you're in the market for a new ride and aren't impressed with what your local Ford dealer in Phoenix has to offer, visit us and we'll help get you out the door and in a brand-new or new-to-you car, truck or SUV! For service, please also reach out to us if you're looking for a particular Ford part for a DIY job. Chances are we can locate it, order it and have it available for pick up at our Phoenix-area Ford dealership within a few short days! 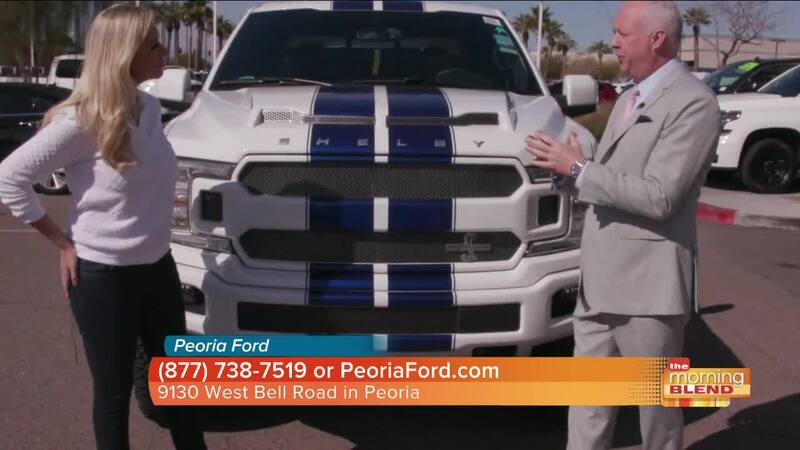 Peoria Ford is conveniently located off of West Bell Road and North 91st Avenue, and proudly serves the communities of Phoenix, Scottsdale, Glendale, Avondale, Mesa, Chandler, Tempe, Gilbert, Surprise and many other surrounding cities. When searching for a "Ford dealership near me" in Peoria, Arizona, Peoria Ford should be your go-to destination. Visit our directions page to find out how easy it is to get to our dealership.